Do you have potholes, sunken utility cuts, depressions/poor water drainage, high spots, excessive cracking, sunken catch basins, or oil spots? If so, then Infrared Heat Asphalt Repair is your solution! The repair process begins with an automatic cycling sequence that transfers infrared energy from the unit to the damaged asphalt surface. This warms the asphalt without damaging the physical properties of the pavement. 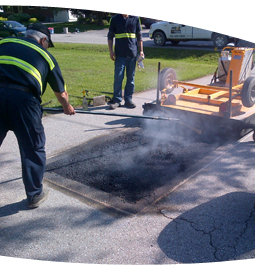 Once the area has been treated with the Infrared system, it is then scarified, a minimal amount of new asphalt is added along with a rejuvination liquid, and then the area is levelled and compacted creating a thermal bond with the surrounding asphalt surface. Proper Infrared Repair will result in a seam-free patch that will outlast any Overlay Paving method traditionally used to address these issues. Best of all...it is yet another one of our eco-friendly options!